Matt Whitaker, a guy who’s spent his life running toilet scams on suckers, and trying to sound smart on Fox News while talking to a braindead audience, is quickly finding out today that he’s not nearly as smart or clever as he thought he was. 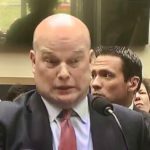 Whitaker’s House Judiciary Committee testimony thus far today has consisted of dimwitted jokes that have prompted the smart people in the room to laugh at him instead of with him, and remarks like “your five minutes are up” that were as inappropriate as they were ineffective. Matt Whitaker was clearly tutored on base-level tactics like repeating the question in the hope of running out the clock, but the people doing the questioning have seen right through it. Whitaker also kept trying to buy time by putting on and taking off a pair of reading glasses that – based on their size in relation to his head – clearly didn’t belong to him. The whole thing was just weird. If you were an SNL writer trying to craft a sketch about a comically inept congressional witness, and you came up with Matt Whitaker, you might get accused of taking things too far over the top. But all popcorn-worthy aspects of today’s debacle of a hearing aside, one point shines through. Matt Whitaker is toast. He’s absurdly in over his head. He’s been exposed today as not prepared to be a witness, and not suited to be Acting Attorney General. His time on the job will be over within a few days, mercifully. He’s toast. We’re also pretty sure Whitaker just got himself rung up for perjury.